The Tripp Trapp Baby Set is made specifically for the Tripp Trapp? 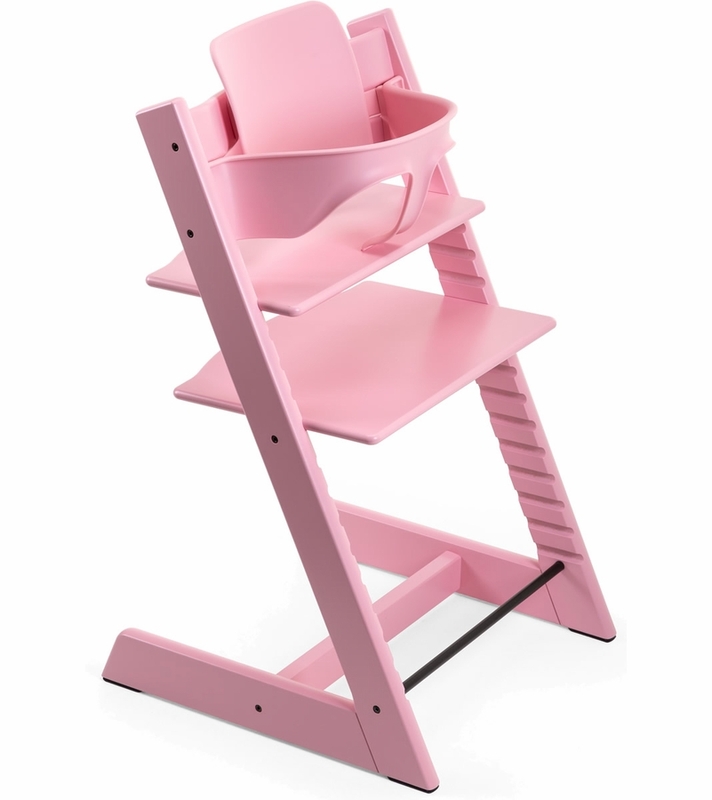 from STOKKE. It made from the environmentally-friendly plastic material that is recyclable and safe for children. The Baby Set includes a seating rail and a baby back plate. It can easily be attached to the Tripp Trapp highchair to provide additional support and stability as well as allowing a baby as young as 6 months old to join the family meal at the dining table. The Baby Set provides more comfort and support which encourages the child to interact more with the family. i bought this chair right before my son turned 5 months and he has been using it since. 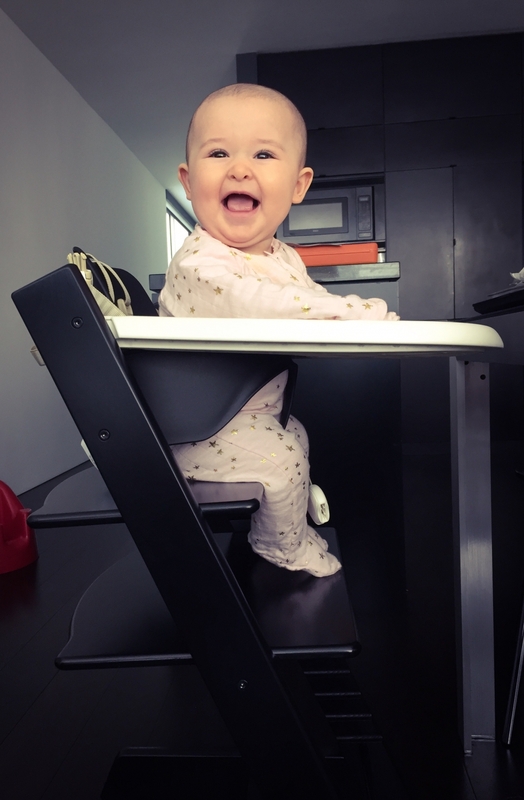 we love this high chair. its sturdy, safe, stylish and grows with child. we�€™re still using the baby set as he just turned one last month. great buy. We love our Tripp Trapp! Very easy to clean! I�€™m a mom of 5 and have been through lots of different ones. This one is my favorite. We purchased the chair with baby set and our LO started to sit in it since 6 months. He is super happy to join us for dinner! The chair is well made, sturdy and stylish. Couldn't be happier with the purchase! It not only looks amazing in our dining room it is super sturdy. Our little one loves climbing on it on her own which is a plus when I am currently pregnant with another one. We wanted something that matches our decor, lifestyle and will grow with the baby. This is perfect. We got ours in while and it goes well with our scandinavian interior. What a game changer! 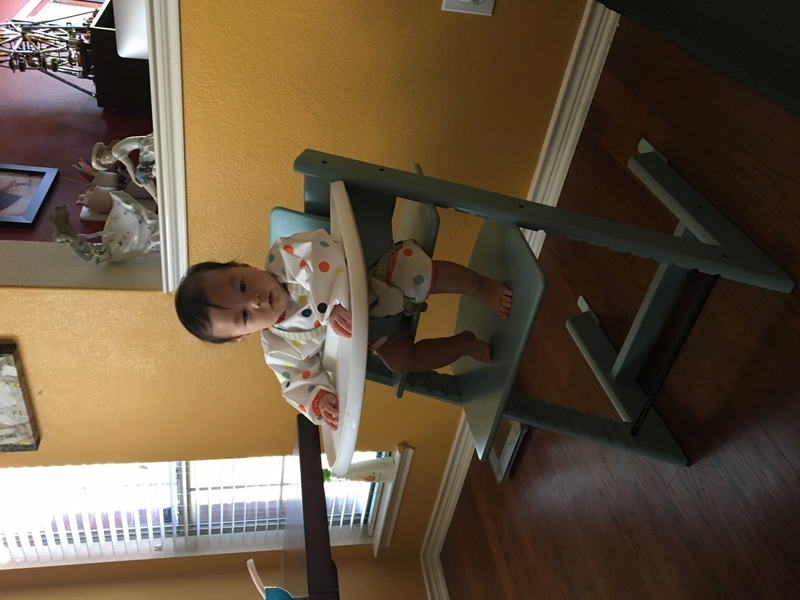 My 17m old was beginning to hate sitting down for meals in his traditional highchair. I didn't like it either because it was so hard to clean and took up too much space. The Tripp Trapp Chair is amazing - my son loves coming to the table to eat now. The chair looks great and is SO easy to clean! ProsVery stable and beautiful next to the dinning table. Easy to assemble. ConsAll the accessories have to be purchased separately. Expensive. 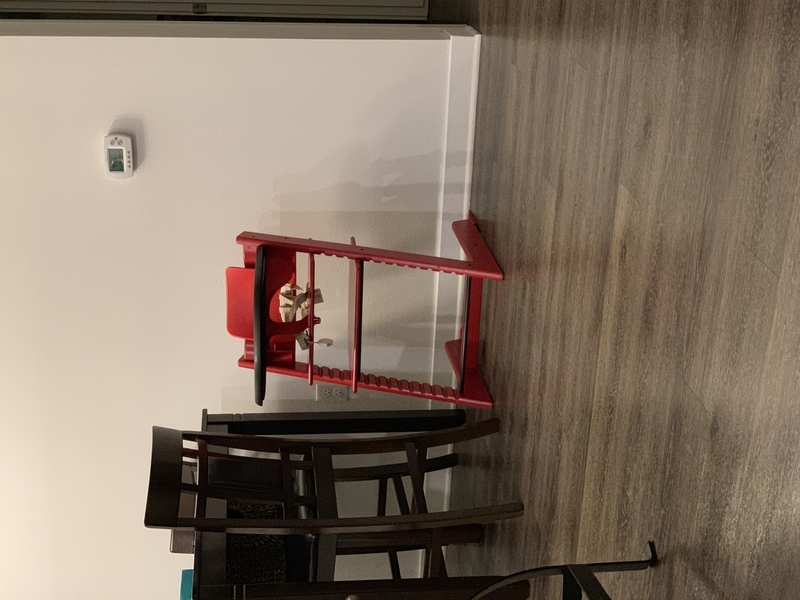 I got this chair, my second Stokke Tripp Trapp, for my 2 year old after she learned to scale the dining room chair into her booster seat. This chair is easier (and in my opinion safer) for a stubbornly independent little one to climb into. She can even strap herself in. Her 4 year old sister also has a Tripp Trapp, and I foresee both being able to use it for a long time. I occasionally sit in it, and if feels sturdy. Both girls eat at the table, so I can't comment on the separate tray attachment. Putting the chair together and adjusting the seat and foot level is relatively easy and intuitive. I did not plan to spend this much on a high chair, but when I thought about the longevity of it I went ahead and splurged. Originally I purchased a complete set, but before opening it returned for just the chair and babyset to save money and only get what I truly wanted/needed. While the cushions are adorable they would need to be washed daily. There's no reason to add to my workload. I purchased the Aqua Blue and it's so fabulous a cushion honestly isn't needed. The chair is always pushed up to the table so it wouldn't show anyway. And baby is wearing a diaper so no cushion needed. The color is more sky and less aqua, but fortunately I still like it. The chair was smaller than I expected which is great. It pulls right up to the table and doesn't take up any more room than the big people's chair. My 6 month old loves being at the table with usUnfortunately, I soon discovered that our table would probably be ruined if I didn't have a tray so I purchased one to use at our nicer table. If we eat in the sunroom we allow that old table to get beat up.The chair is very sturdy and attractive to look at. I may have blown my highchair budget, but I think I'll be happy with this overall. I was hesitant about spending so much on the Tripp Trapp but I have no regrets! The minimal profile, the fact that baby girl is at the table with us, and how well it fits in with our decor without screaming "baby" makes this purchase worth it. Putting it together was super easy! Note: do not tighten all the screws until the very end ... learned that the hard way ha! But still very easy to assemble. 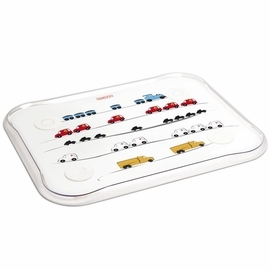 We love this addition to our dining table - perfect to introduce our little one to meal time. Sturdy, easy to assemble and use. Love the Hazy Gray color, looks great ! ProsAdjustments for growing baby / child wonderful. 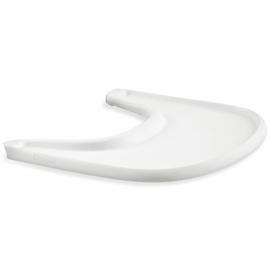 Excellent for serving its purpose & great design to fit a modernist home. Baby LOVED it too. Very easy to put together. Sturdy and easy to clean and easy to adjust to your growing child. I can see this working well as our child gets older and would need a booster chair. I bought two of these in grey for our boys. They are great chairs, easy to assemble, sturdy and easy to wipe clean. I am sure we will enjoy using them for years to come. Vi k�¸bte stolen for et par m�¥neder siden og har v�¦ret rigtig glad for den til vores s�¸n. Stolen lever fuldt ud op til vores forventninger. Vi har tilk�¸bt den hvide bakke dertil men den er vi ikke helt s�¥ imponeret over. Pga farve fra mad s�¦tter sig hurtigt fast i den hvide farve. Zeer tevreden met de kinderstoel. Goed voor intensief gebruik. Kan tegen stootje en zit zeer stevig in elkaar! Makkelijk in elkaar te zetten! Vi kbte stolen for et par mneder siden og har vret rigtig glad for den til vores sn. Stolen lever fuldt ud op til vores forventninger. Vi har tilkbt den hvide bakke dertil men den er vi ikke helt s imponeret over. Pga farve fra mad stter sig hurtigt fast i den hvide farve. de tripptrapp stoel is een erg fijne stoel wij gebruiken heb nu voor onze zoon (2 maanden) met de new born set heel fijn om hem zo erbij te kunnen zetten aan tafel als we eten. De kwaliteit van de stoel valt ons erg tegen: in twee van de bevestigings'moertjes' kregen we de bouten niet gedraaid of heel erg scheef, vanwege niet goed uitgeboorde moertjes. Daarnaast vinden we de stoel slecht gespoten, met name de bovenzijdes van de ruggensteunen. This was a gift from my grandparents and it's such a fantastic highchair. 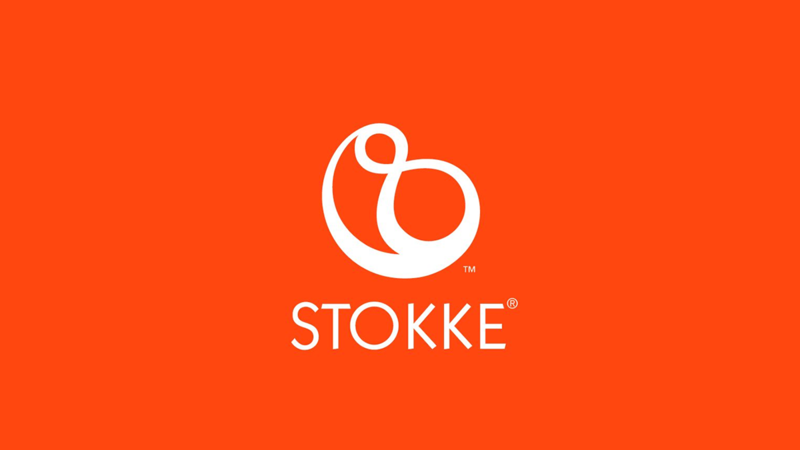 We decided to go for the stokke not just because of its great design but also because of longevity and how it grows with your child. Disputes the initial high cost - price per use over the years it works out to be great value for money. Our little one loves it too! Mooie kinderstoel die bij je interieur past! We are using the chair every evening with diner. The baby can sit nicely in the Newborn Set that we borrowed from friends..
Voor mijn eerste kleinkind had ik al een Stokke kinderstoel, maar toen kwam er een tweeling bij! Daarom een tweede kinderstoel gekocht. We decided to buy the Stokke Tripp Trapp based on friends' recommendations and are so pleased we did. It allowed us to include our son in mealtimes and to get him used to sitting at our level at a table from early on. The chair itself is a great design and, importantly, the fact the leg height is adjustable, means it grows with the child. The sliders on the bottom, lend it extra stability, so even of you have a very active child, who wriggles a lot and tries to stand and is nosey and turns in his chair to get a 360 degree view, around him, you feel safe in the knowledge that he cannot tip backwards and fall! 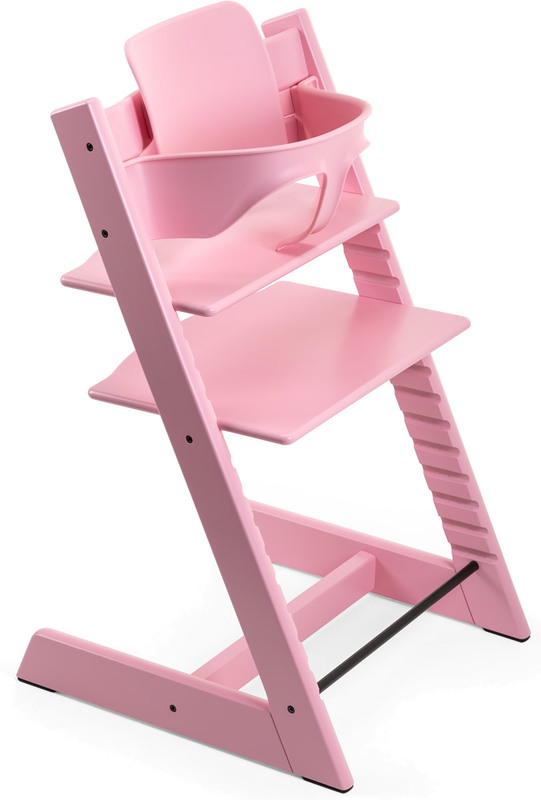 We couldn't recommend the Stokke Tripp trapp enough! Also, the fact that the company offers an extended 7 year warranty, implies they believe deeply in their product safety and design, which in turn helps reassure forever worrying parents! Vi kj�¸pte denne stolen nylig og er storforn�¸yde! Monteringen gikk som en dr�¸m og den er helt fra den ble satt sammen brukt hver dag. Vi fikk sammen med produktet kj�¸pt "nyf�¸dt stolen" som passer oppe denne og her kan babyen sitte trygt og f�¸lge med p�¥ oss mens vi ordner melk eller tran p�¥ kj�¸kkenet ;) Stolen virker veldig solid og vi ser frem til �¥ kunne bruke den i mange �¥r fremover. Vi kjpte denne stolen nylig og er storfornyde! Monteringen gikk som en drm og den er helt fra den ble satt sammen brukt hver dag. Vi fikk sammen med produktet kjpt "nyfdt stolen" som passer oppe denne og her kan babyen sitte trygt og flge med p oss mens vi ordner melk eller tran p kjkkenet ;) Stolen virker veldig solid og vi ser frem til kunne bruke den i mange r fremover. I have been using the Tripp Trapp for 2 months now and I am totally satisfied. My baby girl loves sitting in it. The baby set fits perfectly so she can not get up by herself. The design is really cute and modern and suits our home. Easy to clean It would be even better if it could be folded. C'est notre troisime chaise pour notre troisime enfant et c'est toujours aussi fonctionnel et volutif malgr des accessoires chers. 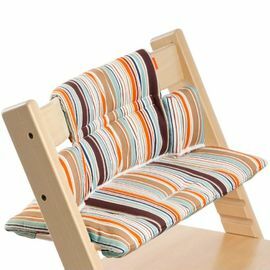 C'est notre troisi�¨me chaise pour notre troisi�¨me enfant et c'est toujours aussi fonctionnel et �©volutif malgr�© des accessoires chers. Nous l avons choisi pour notre an qui avait vraiment du mal passer du rehausseur la chaise traditionnelle . Il est dsormais autonome pour monter et descendre en toute scurit. L assise est confortable. Nous l avons choisi pour notre a�®n�© qui avait vraiment du mal � passer du rehausseur � la chaise traditionnelle . Il est d�©sormais autonome pour monter et descendre en toute s�©curit�©. L assise est confortable. j'avais dj achet la mme chaise pour mon petit fils, il y a 4 ans, il s'en sert toujours. c'est un achat don't je suis entirement satisfaite. j'avais d�©j� achet�© la m�ªme chaise pour mon petit fils, il y a 4 ans, il s'en sert toujours. c'est un achat dont je suis enti�¨rement satisfaite. Nous commenons juste l'utiliser, nous avons acheter le kit, la tablette et les housses donc c'est un bon budget, heureusement que la chaise est volutive. Le dossier ne monte pas assez haut pour que bb repose sa tte donc nous le laissons peu. Il n'y a pas la possibilit d'accrocher un jeu avec un anneau donc les jeux tombent qd il joue.